As Digital Marketing specialists, we are often asked how can advertising in places like Facebook really make a difference and bring a solid return on investment. In this case with Parkers Lighthouse & Queensview Steakhouse, it was a rather simple campaign to create awareness. We asked a simple question to fans and friends which gave them an opportunity to win a $50 gift card. 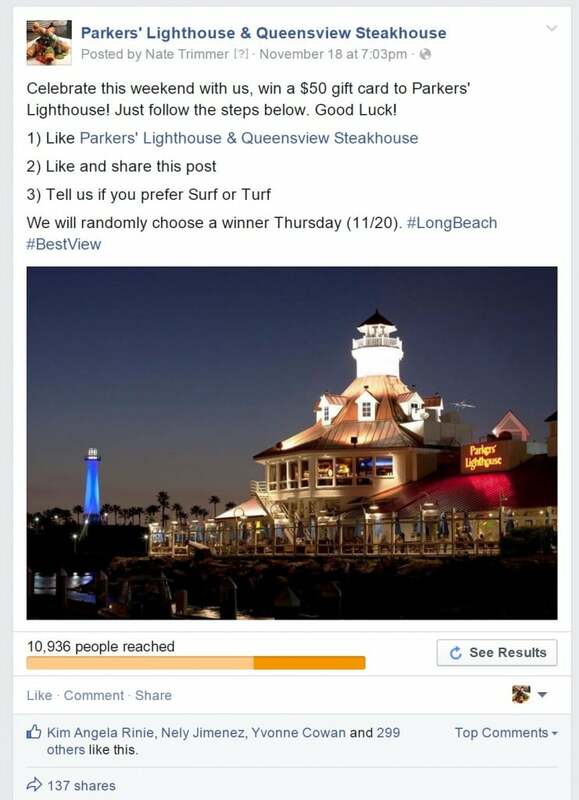 The concept was to post the promotion of a $50 gift card and ask them to “like” Parkers Lighthouse & Queensview Steakhouse if they hadn’t already, to “like” and “share” the post, and to comment if they preferred surf or turf. A winner was randomly selected and given a $50 gift card. This was relatively simple and tremendously effective. The results came in and over 10,000 people were reached by the post. The post received more than 300 likes, 137 shares and 105 comments. It turned out to be pretty much 50/50 on surf or turf with many comments suggesting it is best to enjoy both at the same time! The result and follow-up: The winner from the Long Beach area took a photograph of her food she was enjoying while using her $50 gift card from Parkers Lighthouse and posted it on Facebook. It really did turn out to be a great win-win situation. It depends upon the industry and the goals of the company; but, Facebook can be a valuable tool to harness the followers of a company and to promote something in a way that with small outlay can have a much bigger return and reward in the long run. We’re excited to share this example with you and would be glad to assist in any way to help you have a similar success in your business.